Providing an objective insight into lower limb function and can involve the use of multiple technologies. The most commonly used modality is video analysis and this is a useful tool to aid the clinician in making more informed decisions on an individuals movement patterns and its relationship to lower limb injury. There are numerous packages available to analyze the video footage once taken and these packages offer more potential for in-depth assessment, and the type of information provided is termed 'kinematic' data. Not all patients require video analysis within podiatric practice. The role of an expert clinician is in pattern recognition and a large % of gait analysis is purely visual. It is however essential to see an individual stand and walk if you are to be able to assess the impact of joint restriction and / or pain. A small percentage of patients require further and more detailed analysis than can be provided by video. Do I need more detailed analysis? A number of systems exist that allow an assessment of how pressures act across a foot. This can provide an insight into how the lower limb functions and involves interpretation of information generated by these systems. The type of information provided is in the form of what is termed 'kinetic' data. This information is gathered by systems that involve an individual walking across a pressure plate (a mat composed of tiny pressure sensors that assess the amount of force generated over certain areas of the foot). This is particular useful in patients with foot ulceration in conditions such as Diabetes when designing some form of orthotic (insole) intervention to allow the ulcer to heal by reducing the forces acting on the ulcer site. What are kinematic profiles used for? There are multiple variables that can be assessed with the kinematic profiles and its use is particularly relevant to fine tuning orthotic management. As with the video gait analysis, the system is only as good as the questions asked of it and its interpretation is subjective, based on the view of the clinician using the modality. It is important to reiterate that the use of technology is an adjunct to the clinical examination and not as a stand alone facility. The information gathered in the use of these technologies is an additional tool in clinical reasoning and decision making. The screen shot above shows an example of kinetic data collection. 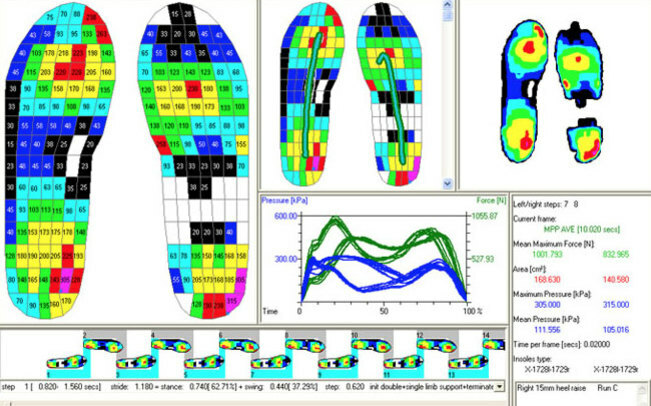 The number values within each cell (foot prints of right and left foot on the top left of the screen shot) relate to the amount of force generated over specific sites of the foot. Data collection performed before and after orthotic intervention can highlight the mechanical effect of orthotic devices and allow certain parts of the treatment to be fine tuned of required. The graph towards the centre of the screen shot illustrates a force-time curve. This is a tool that allows an understanding of how the ankle joint and big toe joint are functioning, and also allows interpretation of how the right ride is functioning compared to the left side. These variables provide an in-depth insight in certain aspects of how a foot and ankle functions. Not all patients require this depth of analysis but this is an important tool in decision making for a group of patients with specific foot and ankle problems.